Let’s talk about the benefits so you can make the right decision and buy with confidence. Our unique well equipped onsite shop provides affordable attire you can try on at the gym to ensure it fits well – e.g. making sure shorts are good to move and kick in or boxing gloves are safe and the quality is right. 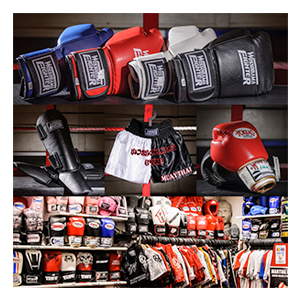 We provide all the equipment you’ll need for our classes & we stock an extensive range of products from top brands at competitive prices. We also offer value for money brands and offer these to you at interne t prices or less. We bulk buy and have numerous trade accounts as well as sponsorship from leading brands so we are able to pass on savings directly to our customers. You are not allowed to train in our gym unless you purchase your martial arts goods from us at our shop as we stock only renowned and established brands. Our supplies are rigorously tested to provide you with the safest and most durable products. Th at’s why we sell specialist and approved martial arts equipment by leading brands only to our customers. Take a step into our merchandise shop & you’ll see what fits.